What’s eleven feet long, made of wood, plastic, and fiberglass, and reeks of virginity and Peter Pan syndrome? It’s a “highly-accurate” 1:1 scale replica of an Imperial Biker Scout and his Speeder Bike from Return of the Jedi. And you can bid on it in this Ebay auction. The seller is asking a mere $6,000 and has zero bids as of the writing of this post, no doubt thanks to the insulting incongruity of the Starship Enterprise appearing next to all the Star Wars goodness. Bad form. I mean, you wouldn’t have one of the girls from The Hills making a Very Special Guest Appearance on Battlestar Galactica, would you? Not unless you enjoy strongly-worded emails typed by sweaty nerd hands, you wouldn’t. Regardless. C’mon, people. Don’t leave this guy hanging. Junior’s college fund will never miss that $1,000 required for “freight costs with crating.” I’m sure it’ll qualify as a tax write-off for your occupation as a Raging Lunatic of a Star Wars Fan. Thanks to Geek Trooper for the delightful find. I want the bike but not the biker. 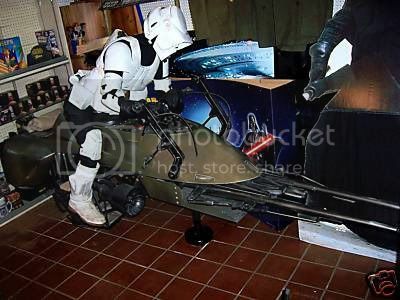 Of course I’d have to get my own Biker Scout costume and… sit on the bike occasionally. Now relisted after it didn’t sell – you can “Buy It Now” for $9,999 (or make an offer).